Originally published in Persian by Hamyaari Media on June 13th, 2017. The original article can be viewed here. Could you please give our readers a brief history of the Persian language program at UBC? When did UBC start the program and why? UBC’s Persian Language and Iranian Studies Initiative was launched in 2011 under the leadership of the Department of Asian Studies in the Faculty of Arts. Thus, Persian language courses have been taught at UBC for six years now. The motivations for launching the initiative are several. First and foremost, Persian language and Iranian Studies are important in their own right and deserve to be taught more widely everywhere. Most of the world’s greatest universities include Persian language and Iranian Studies in their offerings, and as a university now ranked among the world’s top 30 or 40, UBC needs to include this area in its teaching and research. As an Asian Studies department that covers not only East Asia, but other parts of Asia as well, UBC Asian Studies has been particularly keen to add courses in Persian language and Iranian Studies for many years because of the centrality of Persian language, literature and literary culture for more than a thousand years to Central and South Asia. 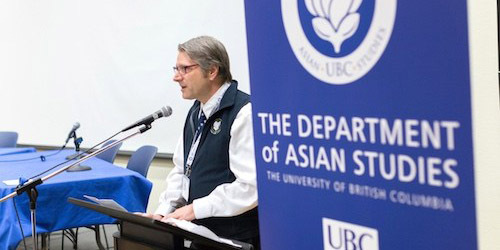 Modern universities and academia carve up the world and knowledge in different ways; in the absence of a strong tradition of ‘Middle Eastern’ Studies at UBC, it is the South Asia specialists at UBC, especially in the departments of Asian Studies and History, who have advocated most strongly for Persian language and Iranian Studies. Another important reason is demographics. Vancouver is home to a significant and growing population of Iranian Canadians, and UBC attracts a large and growing number of students from Iran. In such a context and for the sake of improved intercultural understanding and awareness, UBC needs to be teaching Persian language and Iranian Studies for its diverse student body. How many courses are going to be offered and what are the course descriptions? It is always a challenge to start from scratch a brand-new language program at any university, and it is additionally challenging to do so for so-called ‘LCTLs’ (“Less Commonly Taught Languages”) while juggling the needs of both heritage vs. non-heritage learners. It will take at least ten years for us to find the right balance of courses. These ASIA courses about Iran and Persian literature have been taught so far by a Postdoctoral Teaching Fellow with ad hoc department funding. Who can register for those courses? What is the pre-requisite for each course? Are the courses only offered to Persian-speaking people? First of all, you have to be a registered UBC student to take these courses. Community members have the option of registering as an Unclassified Student on a course-by-course basis. The ASIA courses have no prerequisites and no knowledge of Persian is required. The non-heritage Persian language courses are for students of non-Iranian background with no prior exposure to Persian. Persian 104 (Basic Persian): Restricted to heritage learners of Persian or students who were born in Iran and studied up to (but not beyond) grade 2 in Iran before coming to Canada. Persian 300 (Intermediate Persian): Restricted to students who have passed Persian 104 or to students who were born in Iran and studied up to (but not beyond) grade 6 in Iran before coming to Canada. Persian 400 Short Story (Advanced Persian): Restricted to students who have passed PERS 104 and/or PERS 300 or students who were born in Iran and studied up to grade 12 in Iran before coming to Canada. Students who have studied at the post-secondary level in Iran are not eligible. ‘Heritage learners’ are defined as students with a certain level of oral and/or aural proficiency in Persian because they were raised in a home outside Iran where Persian was spoken. Heritage students have little or no knowledge of or training in reading and writing Persian. Could you please briefly introduce the staff and resources involved in the Persian language program? Our Lecturer in Persian language is Mozhgan Zolfi-Sistani, who earned her BA in Translation Studies in 1995 from Azad University, then her MA in Teaching Persian as a second or foreign language from Shahid Beheshti University in Tehran in 2001. Before immigrating to Vancouver, Canada, in 2011 she was studying Middle Eastern Studies with a focus on teaching Persian as a second or foreign language at the University of Manchester in the UK. She has an ideal background and training for building a Persian language program. Our Postdoctoral Teaching Fellow is Dr. Nasrin Askari, who completed her PhD at the University of Toronto in 2012 in Persian Studies with a dissertation on the Shāhnāma. After designing and piloting the three new ASIA courses on Iran for us, she spent a year at the University of Oxford on a prestigious Bahari Visiting Fellowship in the Persian Arts of the Book at the Bodleian Library, and returned in January of this year to continue teaching at UBC for another 2 years. She published her first book last year: The Medieval Reception of the Shāhnāma as a Mirror for Princes (E. J. Brill, 2016). Both these instructors get excellent course evaluations from their students. Is there any other foreign language offered in your department? The Department of Asian Studies teaches Mandarin Chinese, Classical Chinese, Cantonese, Japanese, Classical Japanese, Korean, Hindi-Urdu, Sanskrit, and Punjabi in addition to Persian. Indonesian was discontinued several years ago due to lack of funding. The Cantonese, Korean, and Punjabi language programs all owe their existence to significant external funding support. What is the prospect of offering those courses at UBC in future? As in all publicly funded universities in North America in recent decades, UBC faces constant and increasingly severe budgetary constraints. This is especially true in the Humanities, and is even more true in what are perceived as ‘exotic’ Area Studies fields. Thus, the future of Persian Language and Iranian Studies at UBC depends crucially on outside funding support—something that is true of most of the other Persian Studies programs in North America (except for some in the USA that receive US government national security-related funding). Another factor that will determine the long-term viability of this initiative is of course student enrollments. Considering how new the courses are, the enrollments so far have been satisfactory and encouraging (especially in the ASIA courses), but we need to do a better job of raising awareness among UBC students about these opportunities. In this regard, we hope that more Iranian heritage students will take our courses, and also encourage their non-Iranian friends to learn Persian! Thank you for taking the time to answer our questions; if there is anything else about the Persian language program, please let us know. I think it is important to emphasize that a new initiative like this takes many years to put on a solid and continuing basis. I also want to stress that our view of Persian language and Iranian studies goes far beyond just the Iranian plateau and a modern-day, nation-centered approach—it’s not just about Iran. For us, what is important is ‘Persianate civilization’ writ large, over the past millennium, along with its huge and enduring impact on so much of Asia around it. This is why Asian Studies is so keen to serve as the anchor department for this new initiative. Finally, we are extremely grateful for the enthusiastic support, both moral and material, that we have received from Iranian Canadians in Vancouver—including UBC students, alumni, friends of UBC and Persophiles more generally. We hope we can count on your continued support!